We've argued before that judging Apple by Steve Jobs may not be such a good idea because of course Steve is no longer around and the company is now run by Tim Cook. Part of our argument was in that Apple has started to take a different approach on lawsuits by seeking settlements rather than the hardline product bans that were the aim under Steve Jobs. Of course, at the time we couldn't say for sure because there was a limited history with Tim Cook by which to say definitively whether the company was really changing or not. Now, Tim Cook himself wants to chime in. After the earnings call today in which Apple announced a better-than-expected quarter, Tim Cook made his views on the patent wars quite clear saying, "I’d rather settle a patent lawsuit, but I don’t want Apple to be the developer for the world, I want people to make their own stuff," adding, "I've always hated litigation, and I continue to hate it." Of course, actions speak louder than words and while Tim says that he hates litigation, nothing has come from Apple's attempt to settle its lawsuit on various Android manufacturers, and is still locked in battles with Motorola, HTC and others. This may not be for lack of trying on Apple's part, but we just don't know. Still, maybe this is another baby step towards a different Apple than the one we've known. Don't expect Tim Cook to be a softie when it comes to patent ligitation. Tim watched Steve Jobs in action for many years before becoming CEO. There is a reason why Apple sues companies that tried to steal Apple's IP. By the way, if you want to read the actual transacript as opposed to reading it from a third source, seekingalpha.com offers free transcripts -- but please read disclaimer. "There is a reason why Apple sues companies that tried to steal Apple's IP" I really hate it when people try to justify Apple's actions by making a blanket statement about other companies "stealing" its "IP." Especially when Apple has been all about doing exactly what other manufacturers are accused of. Well considering android stole patent after patent with the worst OEM being Samsung I'd say ardent has a valid point. taco, for once, back your blank claims up with facts.. links.. something other than.. well.. you. "stole" patent after patent, eh? Samsung has been found guilty of violating what, one, two? And how minor were the changes they had to make? Yeah. As for HTC, same story. And Motorola, well, not only is Apple having a tough time pinning any infringement on them, but Motorola has been having a GRAND old time showing the world how much of their tech has been ripped off by Apple, while the best Apple's gotten has been a couple of gestures and graphics. Is Apple "developer of the world" or "copycat of the world" from "Star Trek" movie's phone and tablet?? improved it and marketing it. The Star Trek producers should sue Apple for copycat of their faked phone and tablet. Looks like cook started getting the heat from kitchen! apple has done their share. they reVitolized an industry that was pretty stagnant. Revolutionized ???? I still take issue with, since they just took everything that was existing and stuck it under one roof in an easy to access grid. apple steals and is stolen from. that is the way of the industry. 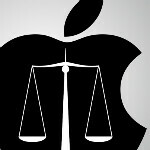 apple is no more innocent than guilty compared to the next person. fanboys on both sides just need to get over that. as far as Tim Cook goes.. I hope he is tired of seeing his brand drug through the mud. He couldnt do anything about it when Steve was in charge.. but now he is. its his shoulders and his confidence. Apple is the "developer for the world?". They just announced high sales for a phone without LTE, doesn't transfer files via Bluetooth, has a small screen, and no memory expansion. They were late when they stole the status bar and gave in to MMS. If Apple is the developer of the world, I guess OEMs that actually offer FEATURES are the developers of the "Galaxy." A normal person would hate taking everything through court.